Hi, I am interested in your 1971 Ford F250 (stock #MHM3129) listed on Autotrader for $18,900. I'd like to get more information about this vehicle and confirm its availability. 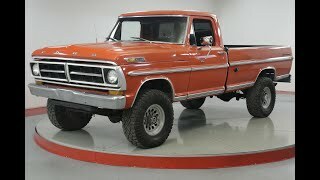 Worldwide Vintage Autos is pleased to present this 1971 Ford F250. The fifth generation of the Ford F-Series is a line of pickup trucks and commercial trucks that were produced by Ford from 1966 to 1972. Built on the same platform as the fourth generation F-series trucks, the fifth generation had sharper styling lines, a larger cab and greenhouse, and expanded engine options. Three trim levels were available during the production of the fifth generation F-series, though the names were changed in 1970. The Base trim became the Custom and the Custom Cab became the Sport Custom joining Ranger as optional levels of equipment and trim. Late in production the Ranger trim level was upgraded with the additional Ranger XLT option. Driveline - both axles gone through completely: New seals and oil. Inspect and repair pumpkins as necessary. New bearings all the way around. Rebuilt Warn locking hubs. New discs, pads, metal brake lines and bleeder tips up front. Turned drums, new hardware, shoes, wheel cylinders, metal brake lines and emergency brake cable out back. New master cylinder with up-graded booster. All u-joints replaced. Drive-shafts checked for damage and balance. NP206 divorced transfer case: flushed, checked, replaced the seals and re-filled it. Granny gear four-speed: flushed, replaced seals, re-filled, etc. New fly wheel and high-pressure clutch and new throw-out bearings. Frame sandblasted and painted with rust control paint.